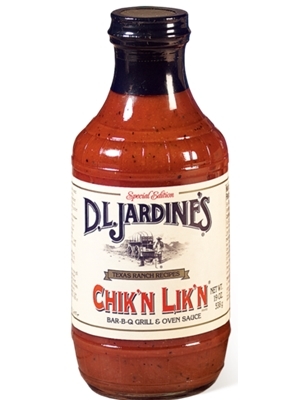 We set out to create the best chicken BBQ sauce around, and with Texas pride, we can say we succeeded. Made with mustard and a touch of our Texas Champagne Pepper Sauce. It's great on chicken, pork, fish, shrimp and wild game. 18 oz. Water, sugar, tomato paste, cider vinegar, worcestershire sauce (distilled vinegar, molasses, corn syrup, water, salt, caramel color, garlic powder, sugar, spices, tamarind, natural flavor), yellow mustard (distilled vinegar, water, mustard seed, salt, tureric, paprika, spice, garlic powder), soybean oil, lemon juice, salt, spices, onion powder, granulated garlic, texas champagne hot sauce (red peppers, vinegar, salt), mustard flour, xanthan gum, dehydrated lemon peel and dehydrated onions.